Not a lot is known about the history of Bobbit’s Hole, or how it got its name, however it is shown on a map dated 1550 which is held in the Guildhall, Harwich. It would have been a very important source of fresh water in the Middle Ages, probably for watering livestock. During the 1800s the area was a cement works owned by Mr John Pattrick and the water in Bobbit’s Hole was used to flush out the channel at Pattrick’s Wharf. In 1906 the Pattrick estate was sold and the area fell into disuse. During the 1800s the land around Bobbit’s Hole was used a cement works. The firm operating next to Bobbit’s Hole was owned by Mr John Pattrick and by the mid-1800s his factory was producing Portland cement which was manufactured from chalk. The cement was shipped out from Pattrick’s Wharf and the water in Bobbit’s Hole was used to flush to clear the silt out from the channel. There is a sluice gate at one side which could be closed to raise the water level and then opened to produce a rush of water. Pollution then became a problem and in 1869 a petition was received at a council meeting which complained that the inhabitants around the area were ‘seriously affected by pestilential effluvia and smoke arising from the Portland Cement Work’. By 1906 the whole estate around Bobbit’s Hole was sold by the Pattrick family. The pond then fell into disuse and was only frequented by children in search of adventure and allotment holders needing water for their crops. In 1976 the Harwich Society Executive Committee made the cleaning and tidying up of Bobbit’s Hole its project for the Silver Jubilee Year of 1977. A ten year lease was finally agreed with ECC in 1978. Work was continued on the site and in 1993 the Society managed to purchase Bobbit’s Hole. Many organisations, working alongside Harwich Society volunteers, gradually renovated and improved the site with assistance from Essex Naturalists Trust and English Nature. 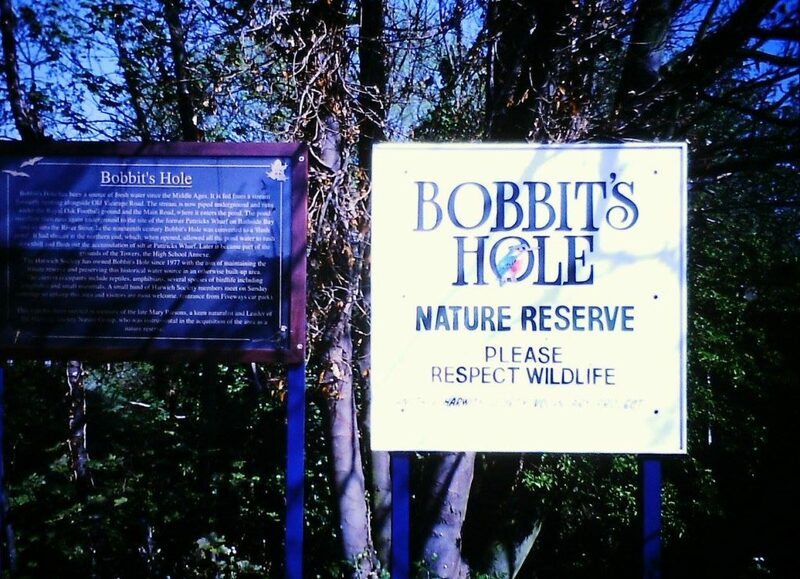 By 2001 Bobbit’s Hole was recognised as a Local Nature Reserve by TDC. 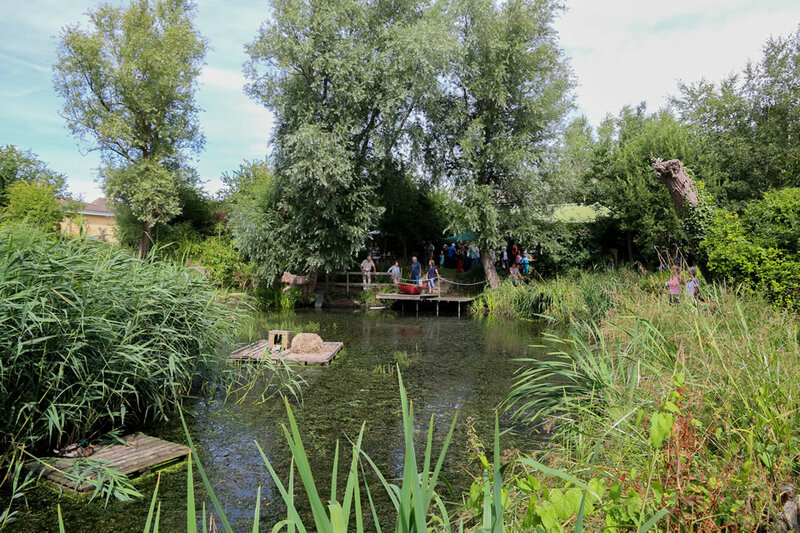 The area is used by many and varied organisations including schools, youth groups such as Scouts, Cubs, Beavers, Brownies, Sea Scouts etc., Homestart, U3A, Photography and Art groups and has even hosted open-air theatre and music events. There is an annual ‘Charity Stroll’ held on the first Sunday in August when a local animal charity is invited to attend and all donation go to their cause. These have included Hedgehog Rescue, Guide Dogs, Canine Partners and Riding for the Disabled. For visitors, Bobbit’s Hole reserve is situated next to Asda on Main Road, Dovercourt. (Postcode – CO12 3HJ). There is parking in Asda car park and the reserve entry gate is to the left of the Asda main entrance. “You will enjoy this quiet haven hidden in the middle of the town”.